The True Gift - Audiobook | Listen Instantly! All year long Lily and Liam look forward to Christmas on their grandparents' farm. It's always the perfect trip -- walking to the lilac library, trimming the tree, giving gifts. But this year, thanks to a white cow alone in the meadow, things will be different. This Christmas, Lily and Liam will find out the meaning of a true gift. From one of our most beloved authors comes a brand-new holiday classic that rings in the season by celebrating the joys of family, community, and true giving. Download and start listening now! “The simple, elegant prose tells a warm family story with a classic holiday theme.
" I love Patricia MacLachlan's writing and I love Christmas stories. This one is a little gem. " " Reading this with Meg and Emma for our Holiday Book. " " One of those short, sweet holiday stories by one of my favorite authors. " " This was a really cute story about a white cow who needed a friend. " " Rosa & I enjoyed this one together. A brother and sister were trying to find a friend for the cow on their grandparents' farm because they thought he was only. The gift they find at the end of the story is really cool! " " I remember loving the author's Sarah, Plain and Tall and a few of her other books, so was excited to read this small Christmas tale. It's a sweet story, but I found it a bit contrived. " " This is a quick read and a sweet Christmas story. Is it true that cows have feelings and are capable of grief, loss, and loneliness? I had no idea! 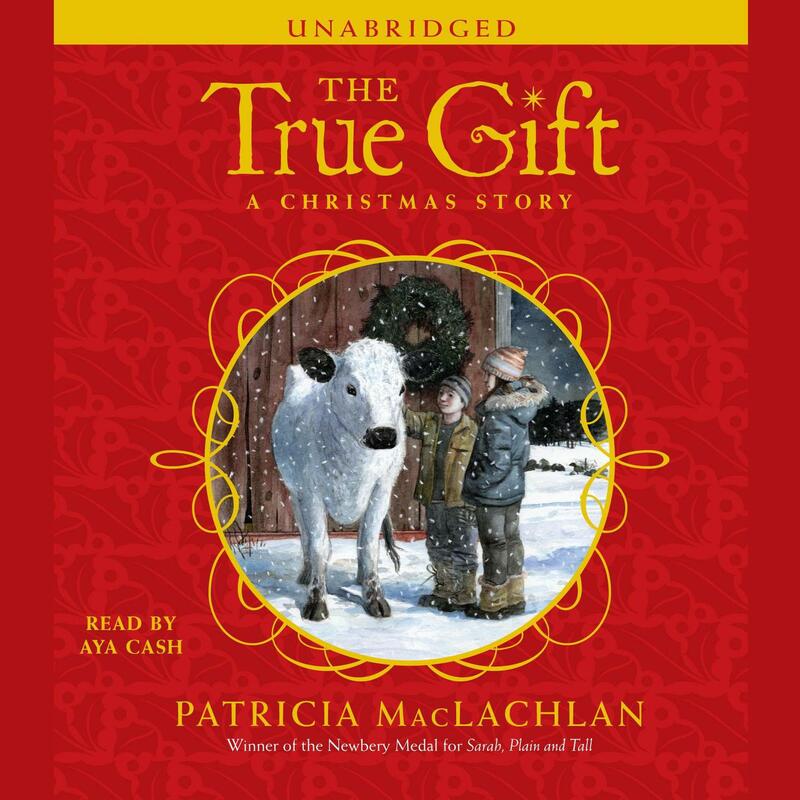 I recommend this for all fans of Patricia MacLachlan and anyone looking for a sweet Christmas story set on a farm. " " Lovely holiday story for all ages. The writing is full of sensory details and vivid images of the small town countryside. If you liked "Sarah, Plain and Tall", you will enjoy this story as well. " " Sweet Christmas story that you will want to share with every child you know. " " Kind of a slow starter, but a sweet, gentle story. (Took me a while to realize it was written as a beginning reader, which was really nice once I caught on!) "
" What a beautiful Christmas story about the meaning of giving a gift! What I really liked about this story is how the children figure it all out themselves. Quick, easy read. Perfect for the whole family! " " Very sweet story. After reading this, I'm one step closer to becoming a vegetarian. " " Found this to be boring and unbelievable. Couldn't get into it. Didn't realize it was a children's book. " " Cute story, though I had the distinct feeling it started out much longer and got edited down. " " Very cute quick read aloud "
" Loved this book since I grew up on a farm. Reminds me of home, and Home of the Brave. Great story for Christmas time. " " Such a wonderful story with an unexpected ending. " " Pretty cute. I read it to my twins who are 6 and they LOVED it. I personally don't like the way it was written but the girls had an easy time understanding it. " " This may be the most adorable christmas story I have read. It is well worth the hour or two it will take to read and will life your spirits! " " I was looking for Christmas stories to read to the kids. This novella was cute but highly predictable. We enjoyed it as a feel-good Christmas story. " " So super cute! " " A wonderful Christmas story about a lonely white cow and two children visiting their grandparents' farm. " " very cute Christmas story for kids. " " This was a good story for my boys. It teaches to look outside yourself at the needs of others . A quick little chapter book with a good message for the season. " " Charming but low-key Christmas story of a boy's efforts to find friends for the lone cow left at his grandparents' farm. He and his sister are able to pool their money to buy a calf, but it's what happens Christmas Eve that's delightful. " " A brother and sister spend Christmas with their grandparents. The grandparent's white cow is lonely, but no one seems to notice except Liam. Let's just say Liam gave White Cow a true gift. It's a quick read but a good one. Very appropriate for young readers. " " Pretty sweet story. A little close to being too precious but not quite. " " this book is based on a true story and if you read this book it gets you emotinol and you feel happy and sad if you read this story. " " A very different Christmas story but I enjoyed it. " " The illustrations in this book were sweet, and the story was enjoyable. One of the main characters is somewhat annoying, but the story is good enough to make it a solid pick for kids around Christmas. " " Very quick read. Nice story to read around Christmastime. " Patricia MacLachlan is the celebrated author of many timeless books for young readers, including Sarah, Plain and Tall, winner of the Newbery Medal. Her novels for young readers include Arthur, For the Very First Time; The Facts and Fictions of Minna Pratt; Skylark; Caleb’s Story; More Perfect than the Moon; Grandfather’s Dance; and Word After Word After Word. She is also the author of many much-loved picture books, including Three Names; All the Places to Love; What You Know First; Painting the Wind; Bittle; Who Loves Me? ; Once I Ate a Pie; I Didn’t Do It; and Before You Came, several of which she cowrote with her daughter, Emily.